I had the original SimCity for the Amiga, but it didn’t really grab me. It wasn’t until SimCity 2000 (Back when you could use 2000 to sound futuristic) that I got hooked in the kind of “What happened to Wednesday, again?” way that that kind of builder game can do. I followed the development of SimCity 3 with interest, when Maxis announced a fully 3D builder game. My very first website had a section on that, Black & White, Age of Empires 2, Alpha Centuri and Quake 3. Eventually they went dark on it, and eventually SimCity 3000 came out, sprite based, very much like a prettier SC2k with added garbage simulation. I was slightly disappointed, but spent a long time playing it anyway. Maxis got distracted by The Sims for a long time. SimCity 4 came with the new 3D engine, but never really grabbed me. SimCity Societies was an attempt to mix The Sims with SimCity and Ceaser 4, but didn’t take off. Eventually EA put SimCity in a box and Maxis became the The Sims company. I’m not going to talk about the launch problems, because I didn’t have any. I don’t have a problem with SimCity’s Always On DRM, for the same reason I don’t have a problem with Diablo 3’s. The transition of the game to a server environment is part of the design, an attempt to make a single player game an ambient online experience. It’s distinct from the Ubisoft varient, where the _only_ reason for the online connection is to prove you’re not a pirate. In both cases, were these new franchises it wouldn’t be a problem, but the transition to an online-only client from a previous offline-only series becomes a problem. I actually think SimCity has more of an excuse for online-only than Diablo 3, and I like the horse-trading aspect of the region game. The problem is, of course, that the servers couldn’t cope. A week after release, it won’t matter. A few months and it will be a dire warning, but right now, it’s a disaster for Maxis and EA. SimCity is what used to be called a thin client, the grunt work of the simulation is being done at the server level, the client makes it look pretty. They ran a few beta tests to get an idea of load, but they made a couple of mistakes. Firstly, the betas were time-limited, so players generally picked a time, spent two hours playing the game, then logged out. The fact that the servers started to break down when players went for four to six hours non-stop play didn’t get hit by the tests because it wasn’t in the scope of them. However, I ordered SimCity from Tesco, because they had it on preorder for £20. Then they didn’t actually send it. Eventually, at nine PM the Sunday after the game’s Friday UK release, I cancelled my “pre”order and bought it on Origin instead. I launched it around 22:00. Then it was 3am, and I looked up from my city for the first time since starting it after the tutorial. So I can safely say it’s still got the addictive thing. Instead of the older games’ multilayered simulations, where you placed power cables for power, pipes for water, roads for transport, dump zones for trash etc. SimCity has reduced all the various layers of the game to a single generic simulation, which works roughly like this: “I am a W, I will eat X agents that come past my road. I produce Y agents and send them down the road”. So, an occupied house produces a Job-Seeking agent, which gets on his bike and wanders down the road until it encounters an industrial building which eats Job-Seeking agents. From that point, the House will produce Working-Sim agents every morning to go to the Job. The working building produces Goods agents, which are eaten by Shops. It also produces Pollution agents, which hang around. A power station produces X Power Agents, which barrel down the road being consumed by every building on the way. Everything produces Trash agents, which hang around until a Garbage-Truck agent (produced by a Dump) passes by and picks it up. Pretty much everything is reduced to agents that flow around the road network, from power to water to sims, to luxuries and also traffic. Most of these are invisible to each other – sewage agents are unaffected by power agents – but all the human elements (Working Sims, Police, Fire, Garbage trucks) all fight for space on the roads. Of course some of the agents are more complicated; Sims get educated to get better jobs, for example. The reduction of the infrastructure to the roads, though, leaves the micromanagement section of SimCity a lot more fun to play than its predecessors, and allows you more time to deal with the bigger problems. Like Traffic. Because everything is on the road, and because Fire Trucks are part of Everything, your biggest problem in SimCity is that the traditional American grid system becomes traditional american Gridlock. Nosim will pull over for a fire truck, or a police van, or even an ambulance You can upgrade roads to better roads, and avenues to better avenues, but to upgrade between the two you have to destroy and rebuild and you will destroy any building using it as a street-front including – and here’s the bugger – any building you have made. Like a power station. The cities are tiny, too. I’m not sure if that’s one of the things that’s been limited for launch – like the inability to run at top speed – and they have said they want to increase it, but to upgrade in SimCity is to destroy your creations. Give in early, destroy and rebuild. Rezone with better layouts, tighter grids, neater spirals. When you get bored of the lot of it, unleash Godzilla, just like old times. SimCity 5/2013/Rebooted/Whatever is the concept of the SimCity games stripped to zero and rebuilt with an eye on displayability, on visualality, and online. With a group of friends – or even just cooperators – in a region, you can build your city better. If one person in a region gets a nuclear power plant, it can power the whole region. You don’t all need a recycling facility if one person’s willing to send out daily trucks. Sharing the simulation means you don’t have to worry about every layer of the game, unless you want to. It’s a hard game to conclude on. 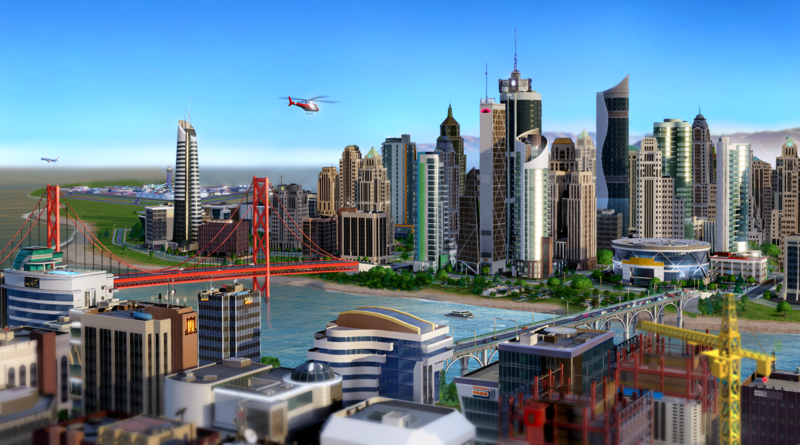 The server woes are going to wreck a lot of peoples’ game experience at launch, but I find it a massive shame that this temporary problem for SimCity (though a symptom of a larger industry problem) is going to be what this game – a great re-imaging of a fading series, and worthy of being so – ends up being famous for.